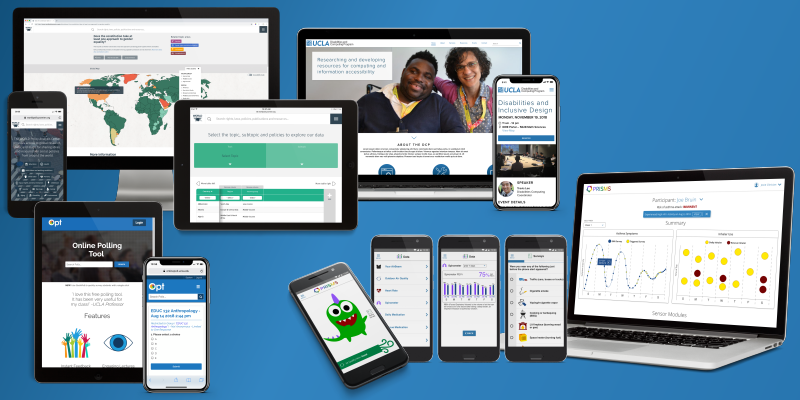 The Mobile and Web Strategy department endeavors to provide UCLA's academic and research community with emerging, accessible and leading edge mobile and web technology. A specialty of MWS is mobile data collection software solutions for research projects and grants. Our department is comprised of four teams: a Mobile Apps Development Team, A Cloud Tools Platform Team, a Web Team and a Disabilities and Computing Program (DCP) Team. Our Mobile and Web Strategy teams are passionate about building mobile apps and websites using Universal Design principles. Universal Design (UD) principles focus on human impact and deliver equitable, flexible, simple and intuitive human friendly interfaces. Following UD principles includes creating tolerant, efficient and perceptive digital experiences in multiple modalities, to maximize communication opportunities. It's hard to do, but we strive for elegant simplicity in everything we do. Our MWS teams are excited to help you design or redesign a mobile app or digital presence for you that works with and for you and your constituents. We combine our expertise to tackle our clients’ challenges, whatever they may be. Some thriving clients want to expand their content distribution channels such as deliver modern messaging to their audiences on their mobile devices. Some clients ask us to transform their digital presence so they can improve their outreach efforts and work more efficiently with their communities. Researchers often want a new way to keep their participants engaged in their research studies. Whatever the challenge, we have the skills and experience to help. As part of UCLA's own technology ecosystem, we’re in a unique position to help you innovate and deliver more modern digital research and service experiences. The Mobile and Web Strategy department is comprised of creative technologists, accessibility engineers, data and interaction designers, data scientists, visualization experts, content, media and visual designers, as well as business strategists. Our multi-disciplinary teams work in concert with you to creatively tackle your challenges. We are committed to an agile process, and constantly refresh it to deliver human-centered experiences and environments that improve and shape our future. We are UCLA's mobile and web strategists, and we believe in Universal Design to deliver access for all.